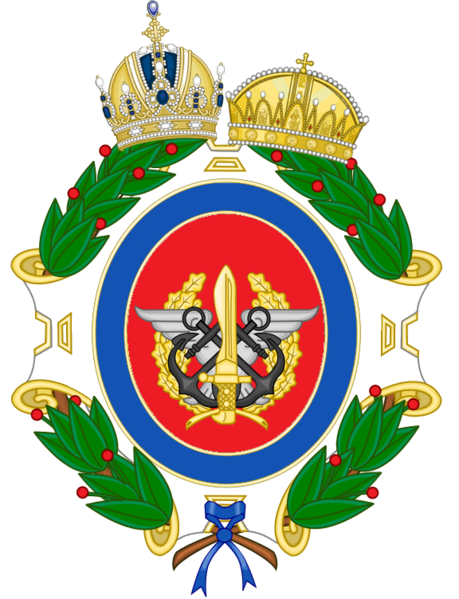 The Imperial and Royal Armed Forces of Karnia-Ruthenia comprises the Armed Forces, the Ministry of War and the Secret Service of Karnia-Ruthenia serve as one of the Empire’s core unifying institutions and primary instruments for defence as well as external power projection. The history of the Imperial and Royal military of Karnia-Ruthenia begins with the creation of the Armed Forces of the Kingdom of Ruthenia and its creation was determined by the signature of the Karno-Ruthenian Compromise of 2016. The military system of Karnia-Ruthenia, based upon the principle of the universal and personal obligation of the citizen to protect his homeland. Its military force was composed of the Imperial and Royal Army, a Imperial and Royal Navy and a Imperial and Royal Aviation Troops. The common army stood under the administration of the joint Minister of War. The common Minister of War was the head for the administration of all military affairs and for all questions related to national defence of the states members of the Empire, but the supreme command of the army is vested in the monarch, who had the power to take all measures regarding the whole army and Commander-in-Chief.